Click any photo below to manually sequence through the gallery. at the Crosby Arboretum in Picayune, Mississippi. John Perilloux demonstrated how to craft tenons with a guillotine tool at October's meeting. To read more and view videos of the demonstration, click here. GCBA has adopted the ABANA Forging Fundamentals Controlled Hand Forging Lessons as our guide in teaching the science and art of blacksmithing to our members. Our experienced members will serve as volunteer instructors for each of the 26 lesson plans, and we hope to teach one lesson at each meeting. GCBA has purchased 15 copies of Randy McDaniel's A Blacksmith Primer: A Course in Basic and Intermediate Blacksmithing, now available for member use or purchase. 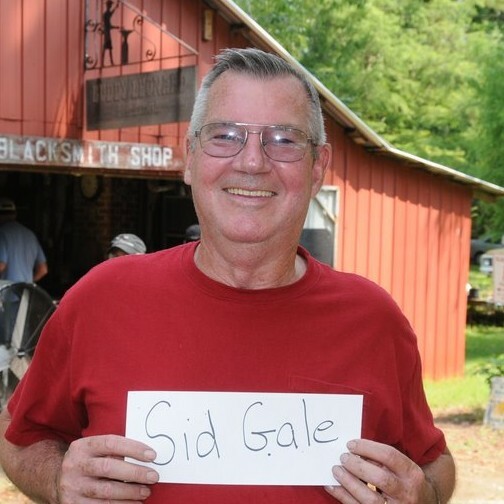 Glen Wesley, a longtime member of the Gulf Coast Blacksmith Association, has been diagnosed with Lou Gehrig’s disease (ALS). As the disease progressed he began having difficulty feeding himself. He asked Sid Gale to help him design a device that would enable him to continue feeding himself without assistance. They discussed it, made a few sketches and headed out to the shop. Discover how they designed and developed an Assisted Eating Device. The 2012 Brian Brazeal Tool Workshop in October was a huge success. Watch as he makes tooling and forges a hammer head from round stock. Chuck highly recommends Peter Ross' insightful Keynote Address at the 1998 ABANA Conference on the emergence of "machine mentality" over "hand mentality". Ross was the Master Blacksmith at Colonial Williamsburg from 1979 to 2004. See our coverage of Fire in the Swamp 2012, a one-stop shop for demos on forging, iron and pewter casting, and pottery crafts. Did this creature crawl out of the bayou behind Buddy’s shop? 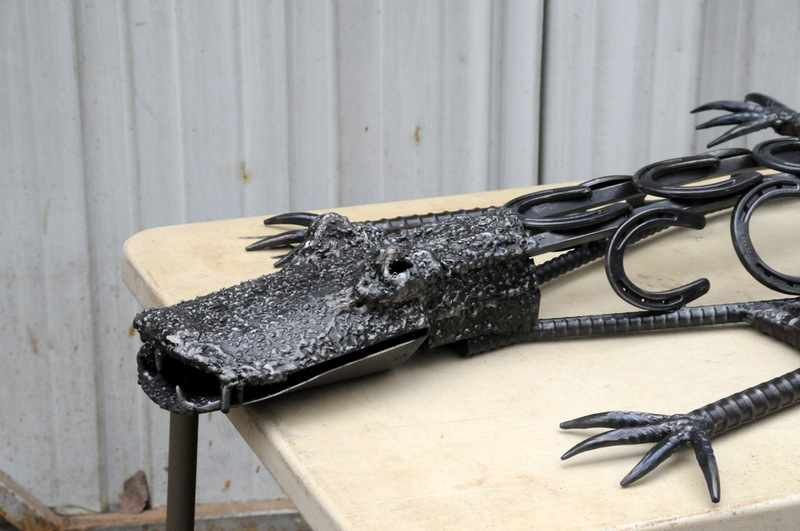 See Sid Gale's Gator, featured at our February meeting. GCBA provided demonstrations at the 2012 Arboretum Day. A leaf key ring begins at the end of a bar. Watch Brian Brazeal show us how it's done at our January meeting. See Phil Love demonstrate the craft at Colonial Day, an annual event at St. Edward the Confessor School in Metairie. Students dressed in period costume and took part in various events reminiscent of early America life. Watch our GCBA demonstrators do their magic at the 26th Scottish Highland Games & Celtic Music Festival. Discover some very interesting metal art at one of the most unusual festivals in the country, the Bush Tractor Festival. Chuck recommends the article Of Iron & Stagecraft by Trenton Ty, from the current edition of The Iron Trillium, a publication of the Ontario Artist Blacksmith Association. Let renowned metal artist Valentin Yotkov introduce you to the ancient art of Ornamental Chasing And Repoussé: The Magic of Sculpting in Metal. This excerpt from his upcoming book is an excellent primer on adding Repoussé and Chased items to your work. GCBA President Chuck Robinson was profiled by the Picayune Item newspaper in an in-depth article, Local Blacksmith, Chuck Robinson, on the Art of Blacksmithing. Read the Craftpersons Profile of GCBA Chairman Larry House in the Folklife & Folk Artist Directory of the Mississippi Arts Commission. Read the biographical article on GCBA member Glen Wesley, featured in Neighbors—The Lifestyle Magazine. Check out Tim LeMien's creative restoration of an antique fire pot. Check out our unique collection of Period Sketches, Paintings and Photos depicting blacksmithing throughout history. Discover The Legend of The Iron Worker and King Solomon and the extraordinary metal engraving by John Sartain depicting the blacksmith who challenged the great artisans at the dedication banquet of the Temple of Jerusalem. Browse our collection of Vintage Art styled after the classic American poem, The Village Blacksmith, by Henry Wadsworth Longfellow. Check out our ABANA page for links to current ABANA News Topics and sections of the ABANA website most relevant to GCBA members. Chuck Robinson recommends the new Bronze Casting Manual written by Olivier Duhamel of New Zealand, on low-cost bronze lost wax casting of small projects. See our newly updated list of Free Blacksmithing Books, Newsletters and Articles in the In Print section of our Links page. Discover what real blacksmiths do for entertainment. Watch this recent CBS Evening News report on Shooting Anvils. Take Rob Whitehurst’s amazing photo tour of a Japanese Swordsmith Shop and a Vietnamese Smithy. Discover Who's Who in our growing gallery of GCBA Member Mug Shots. Read the Artist Biography of our own William “Buddy” Leonard at the Louisiana Folklife Center located at Northwestern State University. View this website in over 50 languages — including a French version for our Acadian friends in southern Louisiana.